I always wanted a big hair curler to play around with my hair at home. You know that big perm ala-ala VS model. ceh! So I tried out this one from Supermodel Secret's. It has a ceramic technology that said to closes the cuticle and lock your hair style in place and create a smoother finish. The barrel has a 38mm wide, close to 1.5inch is I am not mistaken. Larger barrel gives more bigger and bouncy curls. With a simple turn on button and heat adjustment, I usually go for 180 Celsius. When starting, I leave it for about 1 minute before using it. I also use a glove to protect my hand and for easy handling when I am curing my hair. You ca just buy the glove at any hardware store, no need fancy ones, as long as it protects your hand, then you are good. All you have to do is wrap your hair around the barrel, from the tip if your hair to the top then clip it on the clipper. Leave it for about 20 seconds and release it. The hair curler comes with an international plug, but it also comes with our standard plug head that you can just easily attach it to it. Even if you travel to an international country, you can switch it to the other plug. Travel friendly! So far I am loving the result, to keep my hair in place I use the Lucido-L hair perm cream to keep it in style. 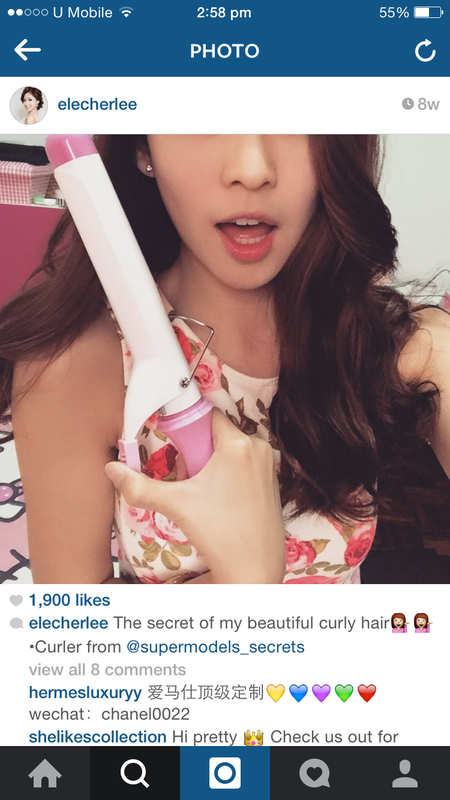 Below image is an actual image by an Instagram-er @elecherlee on how she perm her hair using this hair curler. Sorry I can;t show my hair so yeah haha.